In older sources, the peninsula between Delaware Bay and Chesapeake Bay was referred to variously as the Delaware and Chesapeake Peninsula or simply the Chesapeake Peninsula. The northern isthmus of the peninsula is transected by the sea-level Chesapeake and Delaware Canal. Several bridges cross the canal, and the Chesapeake Bay Bridge and the Chesapeake Bay Bridge–Tunnel join the peninsula to mainland Maryland and Virginia, respectively. Another point of access is Lewes, Delaware, reachable by the Cape May–Lewes Ferry from Cape May, New Jersey. Dover, Delaware's capital city, is the peninsula's largest city by population, but the main commercial area is Salisbury, Maryland, near its center. Including all offshore islands (the largest of which is Kent Island in Maryland), the total land area south of the Chesapeake and Delaware Canal is 5,454 sq mi (14,130 km2). At the 2000 census the total population was 681,030, giving an average population density of 124.86 inhabitants per square mile (48.21/km2). Cape Charles forms the southern tip of the peninsula in Virginia. The entire Delmarva Peninsula falls within the Atlantic Coastal Plain, a flat and sandy area with very few or no hills; the highest point in the peninsula is only 102 ft (31 m) above sea level. The fall line, found in the region southwest of Wilmington, Delaware, and just north of the northern edge of the Delmarva Peninsula, is a geographic borderland where the Piedmont region transitions into the coastal plain. Its Atlantic Ocean coast is formed by the Virginia Barrier Islands in the south and the Fenwick Island barrier spit in the north. Delmarva is driven by agriculture and commercial fishing. Most of the land is rural, and there are only a few large population centers. The border between Maryland and Delaware, which resulted from the 80-year-long Penn–Calvert Boundary Dispute, consists of the east-west Transpeninsular Line and the perpendicular north-south portion of the Mason–Dixon line extending north to just beyond its tangental intersection with the Twelve-Mile Circle which forms Delaware's border with Pennsylvania. The border between Maryland and Virginia on the peninsula follows the Pocomoke River from the Chesapeake to a series of straight surveyed lines connecting the Pocomoke to the Atlantic Ocean. All three counties in Delaware— New Castle (partially), Kent, and Sussex—are located on the peninsula. Of the 23 counties in Maryland, nine are on the Eastern Shore: Kent, Queen Anne's, Talbot, Caroline, Dorchester, Wicomico, Somerset, and Worcester, as well as a portion of Cecil County. Two Virginia counties are on the peninsula: Accomack and Northampton. The following is a list of some of the notable cities and towns on the peninsula. Chestertown, Maryland, is the county seat of Kent County and the home of Washington College. Centreville, Maryland, is the county seat of Queen Anne's County. Easton, Maryland, is the county seat of Talbot County. St. Michael's, Maryland, is a popular tourist destination. Dover, Delaware, is the Delaware state capital and the peninsula's largest city in terms of population. Lewes, Delaware, is the site of the first European colonization in Delaware, is nicknamed "the first town in the first state", and is a port city for the Cape May–Lewes Ferry. Ocean City, Maryland, is a popular beach and resort town. Crisfield, Maryland, is a notable source of seafood. Seaford, Delaware, the "Nylon Capital of the World", is the largest city in Sussex County. Salisbury, Maryland, is the county seat of Wicomico County, the second largest city in the peninsula and the lower peninsula's only urbanized area. It is known as the "Crossroads of Delmarva". It is home to the Salisbury–Ocean City–Wicomico Regional Airport, the only airport on the peninsula with scheduled commercial flights. Delmar, Maryland, part of the Salisbury Urbanized Area, lies across the Maryland-Delaware border from its twin, Delmar, Delaware, on the Transpeninsular Line. 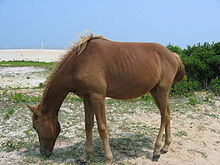 Chincoteague, Virginia, is noted for its wild ponies and its beaches, administered by the U.S. Fish & Wildlife Service through Chincoteague National Wildlife Refuge. Princess Anne, Maryland, is the county seat of Somerset County. Cambridge, Maryland, is the county seat of Dorchester County and a busy port on the Choptank River. Rehoboth Beach, Delaware, "the Nation's Summer Capital", has a sixteenfold increase in population from winter to summer. At its southern tip, the Delmarva Peninsula is now connected to Virginia Beach and Hampton Roads, Virginia, via the Chesapeake Bay Bridge-Tunnel which opened in 1964. 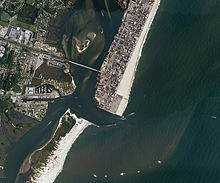 The bridge tunnel is owned and administered by the Chesapeake Bay Bridge and Tunnel District. The Chesapeake Bay Bridge-Tunnel currently has a $13.00 (US) toll for single private vehicles ($5.00 for return within 24 hours) and is patrolled by the Chesapeake Bay Bridge Tunnel Police Department. Some studies have shown that Native Americans inhabited the peninsula from about 8000–10000 BC – since the last Ice Age. In 1970 a stone tool (a biface) said to resemble Solutrean stone tools was dredged up by the trawler Cinmar off the east coast of Virginia in an area that would have been dry land prior to the rising sea levels of the Pleistocene Epoch The tool was allegedly found in the same dredge load that contained a mastodon's remains. The mastodon tusks were later determined to be 22,000 years old. In addition several archaeological sites on the Delmarva peninsula with suggestive (but not definitive) dating between 16,000 andir settlements relocated as natural conditions dictated. They set up villages – scattered groups of thatch houses and cultivated gardens – where conditions favored farming. In the spring they planted crops, which the women and children tended while the men hunted and fished. In the fall they harvested crops, storing food in baskets or underground pits. During the harsh winter, whole communities would move to hunting areas, seeking the deer, rabbit and other game that kept them alive until the spring fishing season. When the farmland around their villages became less productive – the inhabitants did not practice crop rotation – the native people would abandon the site and move to another location. The primary Indians of the ocean side of the lower peninsula prior to the arrival of Europeans were the Assateague, including the Assateague, Transquakin, Choptico, Moteawaughkin, Quequashkecaquick, Hatsawap, Wachetak, Marauqhquaick, and Manaskson. They were all under the guidance of the Chief of the Assateague. They ranged from Cape Charles, Virginia, to the Indian River inlet in Delaware. The upper peninsula and the Chesapeake shore was the home of Nanticoke-speaking people such as the Nanticoke and Choptank. The Assateague and Nanticoke made a number of treaties with the colony of Maryland, but the land was gradually taken for the use of the colonists, and the native peoples of the peninsula assimilated into other Algonquian tribes as far north as Ontario. In 1566, an expedition sent from Spanish Florida by Pedro Menéndez de Avilés reached the Delmarva Peninsula. The expedition consisted of two Dominican friars, thirty soldiers and a Virginia Indian boy, Don Luis, in an effort to set up a Spanish colony in the Chesapeake. At the time, the Spanish believed the Chesapeake to be an opening to the fabled Northwest Passage. However, a storm thwarted their attempts at establishing a colony. The land that is currently Delaware was first colonized by the Dutch West India Company in 1631 as Zwaanendael. That colony lasted one year before a dispute with local Indians led to its destruction. In 1638, New Sweden was established which colonized the northern part of the state, together with the Delaware Valley. Eventually, the Dutch, who had maintained that their claim to Delaware arose from the colony of 1631, recaptured Delaware and incorporated the colony into the Colony of New Netherland. However, shortly thereafter Delaware came under British control in 1664. James I of England had granted Virginia 400 miles of Atlantic coast centered on Cape Comfort, extending west to the Pacific Ocean to a company of colonists in a series of charters from 1606 to 1611. This included a piece of the peninsula. The land was transferred from the Duke of York to William Penn in 1682 and was governed with Pennsylvania. The exact border was determined by the Chancery Court in 1735. In 1776, the counties of Kent, New Castle, and Sussex declared their independence from Pennsylvania and entered the United States as the state of Delaware. In the 1632 Charter of Maryland, King Charles I of England granted "all that Part of the Peninsula, or Chersonese, lying in the Parts of America, between the Ocean on the East and the Bay of Chesapeake on the West, divided from the Residue thereof by a Right Line drawn from the Promontory, or Head-Land, called Watkin's Point, situate upon the Bay aforesaid, near the river Wigloo, on the West, unto the main Ocean on the East; and between that Boundary on the South, unto that Part of the Bay of Delaware on the North, which lieth under the Fortieth Degree of North Latitude from the Equinoctial, where New England is terminated" to Cecil Calvert, 2nd Baron Baltimore, as the colony of Maryland. This would have included all of present-day Delaware; however, a clause in the charter granted only that part of the peninsula that had not already been colonized by Europeans by 1632. Over a century later, it was decided in the case of Penn v. Lord Baltimore that because the Dutch had colonized Zwaanendael in 1631, that portion of Maryland's charter granting Delaware to Maryland was void. The peninsula was the premier location for truck farming of vegetables during the 19th and early 20th centuries. Though it has been largely eclipsed by California's production, the area still produces significant quantities of tomatoes, green beans, corn, soy beans— Queen Anne's County is the largest producer of soy beans in Maryland—and other popular vegetables. The Eastern Shore is also known for its poultry farms, the most well-known of which is Perdue Farms, founded in Salisbury. The Delaware is a rare breed of chicken created on the peninsula. Tourism is a major contributor to the peninsula's economy with the beaches at Rehoboth Beach, Delaware, and Ocean City, Maryland, being popular tourist destinations. The peninsula has minor airports with few commercial carriers, as it is overshadowed by proximate major airports in Baltimore and Philadelphia. Its airports include Wilmington Airport southwest of Wilmington, Delaware, Salisbury Regional Airport to the southeast of Salisbury, Maryland, and Dover Air Force Base to the southeast of Dover, Delaware. Major north-south highways include U.S. 9, U.S. 13, U.S. 50 and U.S. 301. Highways U.S. 50 and U.S. 301 run over the Chesapeake Bay Bridge on the western side of the peninsula. U.S. 13 at the southern limit of the peninsula connects through the Chesapeake Bay Bridge–Tunnel to the main part of Virginia. The Cartoon Network show Steven Universe uses Delmarva as its setting. ^ Annual Report of the Secretary of the Commonwealth to the Governor and General Assembly of Virginia for the Year Ending September 30, 1914 (Richmond, Va., 1915), p. 267. ^ See, e.g., Michael F. Mulrooney, The Delmarva Peninsula (Wilmington, Del.? : Hearn Oil Co., 1926): the earliest use of the name in a title, per WorldCat. ^ "Stillpond Neck". Peakbagger. Retrieved 19 February 2014. ^ "President Map". The New York Times. 9 December 2008. Retrieved 3 June 2013. ^ Jones, Pattrice (1 January 2009). "Let the diversification of Delmarva's economy begin". DelmarvaNow.com. Archived from the original on 23 September 2015. ^ "The Mid-Atlantic Dialects". Evolution Publishing. Retrieved 3 June 2013. ^ Gosier, Chris (February 20, 1998). "Would-be Secessionists Dream Up the State of Delmarva". Capital News Service. Archived from the original on March 10, 2014. ^ "Secession movement has long history on state's Eastern Shore". The Star Democrat. Easton, Maryland. March 18, 1994. ^ Plowman, Terry (October 1999). "Delmarva Millennium- Volume I". Thomson-Chesapeake. Archived from the original on 3 November 2013. Retrieved 8 July 2013. ^ Jerald T. Milanich (February 10, 2006). Laboring in the Fields of the Lord: Spanish Missions And Southeastern Indians. University Press of Florida. p. 92. ISBN 978-0-8130-2966-5. Retrieved June 25, 2012. ^ "Delmarva Central Railroad - Carload Express, Inc". carloadexpress.com. Retrieved 2018-10-21. "Assateague History". History of the Assategue People. Archived from the original on March 7, 2005. Retrieved March 3, 2005. "Maryland Charter". The Charter of Maryland at the Avalon Project. Archived from the original on March 5, 2005. Retrieved March 3, 2005. "Virginia Charter". The Charter of Virginia at the Avalon Project. Archived from the original on March 1, 2005. Retrieved March 3, 2005.